In the second phase, the jury voted only for Nehru, Ambedkar, Patel and JRD. Five members of the jury failed to cast their vote for anyone. What a juvenile idea!”—so exclaimed many Outlook readers when the poll to determine the Greatest Indian after Gandhi, conducted in conjunction with CNN-IBN and History18 Channels with BBC, was first announced. India, they said, is a great country with great many contributions from extraordinary men and women. But to choose just one of them and anoint him or her the ‘greatest’? The idea appeared absurd to many, frightened others, while the more paranoid saw in it a conspiracy to divide the country. The majority were plainly outraged or sceptical. The greatest Indian after Gandhi is yet to be born, a few of our readers said acerbically. Others questioned the ‘infantilisation’, the ‘crass commercialisation’ of the great while yet others remonstrated that singling out the ‘greatest’ amounted to belittling the contribution of the rest. Another section added their own names of the greats they felt we had missed out on, or ignored. That the venerable British Broadcasting Corporation (BBC) had perfected the format over a period of time, in 21 countries, and that the hunt for the greatest Indian would be made once and only once, only partially put the doubters at peace. That such a poll had earlier been successfully conducted in Great Britain, Germany and South Africa—throwing up Winston Churchill, Konrad Adenauer and Nelson Mandela as the greatest Briton, German and South African respectively—elicited the standard response: those countries were smaller, more homogeneous and arguably far less complex than India. Quite clearly, the search in India was not going to be easy. The greatest Indian would have to be one who had affected the lives of the “maximum number of Indians for the better, since independence”. Leadership, genius and compassion were to be the parameters. It is interesting to note that similar polls in Europe had thrown up Alexander the Great in Greece and Leonardo da Vinci in Italy. The possibilities in India would have been endless with Vyasa and Valmiki vying with the Buddha and other all-time greats. Conscious of the challenge and aware of the scepticism, Outlook and CNN-IBN settled on a three-way voting process, with a 33 per cent weightage for each of the three constituents. Then, people were invited to vote online at thegreatestindian.in or through a missed call for their favourite. Arrangements were made to ensure that one mobile phone or a landline could be utilised to register one vote and eliminate duplication and bulk voting. To make it even more error-free, polling agency ACNielsen was engaged to conduct a survey on the ground and rank the finalists on the basis of an opinion poll with an admittedly small but representative sample of 1,027 per phase. The response to the poll in the social media was electric. The official ‘handle’ of History TV18 reached out to a staggering 2,18,690 Twitter users every day during the first five weeks, the first phase in June. The Greatest Indian page on Facebook was shared over 16,000 times and registered over 2,00,000 ‘likes, comments and shares’. Dr Ambedkar led from the start, polling more votes in the second phase than the rest of the nine put together. After the first phase of voting, 10 highest vote-getters were shortlisted for the last lap and people invited again to vote for the ‘greatest’ among the ten. To reduce potential mischief through bulk voting, the jury was also invited to vote and rank the 10 finalists, and given the same weightage—one-third—as the popular vote. ACNielsen repeated the ground survey in the second phase: this ranking too was given similar weightage. Auditing firm Grant Thornton audited the entire process. Despite such efforts, it’s possible that some groups took the poll more seriously than others. There is also a regional skew, with people in some states casting far more votes than in others and far few in others. The nominees too received more votes from some states. 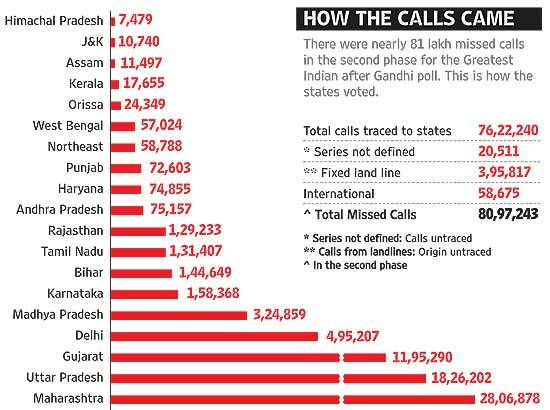 The highest number of missed calls were received from Maharashtra, followed by Uttar Pradesh and Gujarat. Polls are rarely perfect. But they are the best indicators we have of how people view things. Dr Ambedkar led the pack almost from the start, polling more popular votes in the final phase than the nine others polled together. A.P.J. Abdul Kalam and Vallabhbhai Patel were the other favourites; the rest lagged far behind. How they fared in each of the three rankings is explained here. Popular Votes: Over 1.8 million votes were cast during the two-phase polling. Missed calls totalled more than 8 mn in the second phase alone and constituted more than 95 per cent of the votes polled. Besides, there were online votes and endorsements on Facebook. All votes were then audited by Grant Thornton to weed out duplication, bulk and doubtful votes. Eventually, 4.3 mn votes were considered for the final reckoning in the second and final phase. Only four of the 10 finalists, however, turned out to be serious contenders. While Ambedkar was a runaway winner with 1.9 mn popular votes in the second phase, Kalam (1.3 mn), Patel (5,58,000) and A.B. Vajpayee (1,67,000) were the only ones who received some semblance of popular support. Astonishingly, the widely acknowledged first family of Indian politics fared poorly. Jawaharlal Nehru was left tottering last in the list with less than 10,000 votes. Indira Gandhi fared marginally better, polling over 17,000 votes. The remaining four in the top 10 were not statesmen or politicians. 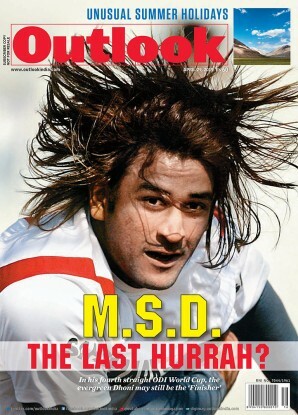 A cricketer, an industrialist, a saintly social worker and a legendary singer were the others in the reckoning. While Mother Teresa led this pack with over 92,000 votes, J.R.D. Tata followed with just over 50,000 while Sachin Tendulkar secured 47,000 votes. Curiously, the singer who continues to move and stir the nation with her melodious voice, Lata Mangeshkar, received only 11,000 votes. Market research: The ground survey conducted by Nielsen, however, placed Kalam at the top, with 19.8 per cent of the respondents describing him as the greatest Indian after Gandhi. Significantly, the random survey with a sample size of 2,000 placed Indira in second place and Mother Teresa in the third. Tendulkar and Nehru occupied the fourth and fifth slots, securing 12.6 and 12.5 per cent of the endorsements. 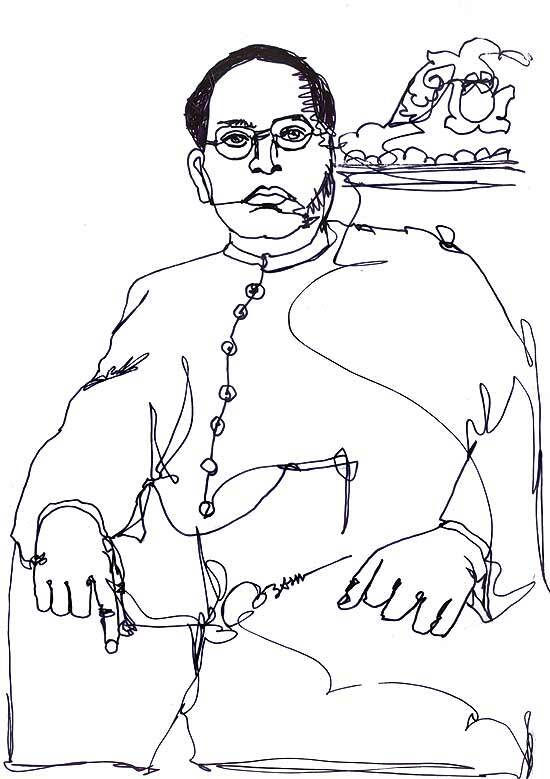 Dr Ambedkar, who received the highest number of popular votes and was ranked second by the jury, occupied the sixth slot in the survey. Indeed, compared to the 12.5 per cent endorsement for Nehru, Ambedkar was endorsed by only 7.7 per cent of these respondents, indicating that top-of-the-mind recall is still higher for Nehru. The jury: The members were overwhelmingly of the opinion that Nehru remains the greatest Indian after Gandhi. And while the members did place Dr Ambedkar in second place, he actually received just six votes compared to the 14 for Nehru. While two of the jury members voted for Vallabhbhai Patel and one for J.R.D. Tata, none of the others cut any ice with any of the jury members. Neither Indira nor Vajpayee or anyone else received a single vote from the jury.